Have one of these in 2018, or else! CONCORD, NH — Good news, maybe, depending on your point-of-view. From here on out inadequate search and rescue budgets be damned, negative environmental impacts a thing of the past, and those oh-so-hated summit crowds now nevermore. Why? 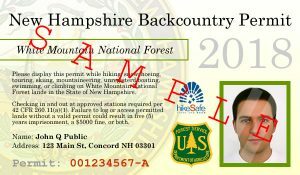 A new federally-issued “New Hampshire Backcountry Permit” — slated to go into effect as early as the spring of 2018 — looks to end these and other user-related problems in the White Mountain National Forest of New Hampshire. The ultimate aim of the permitting process is to limit access thus reducing crowds by up to 87%, according a spokesman citing a recent impact study conducted by the United States Forest Service, USFS. So why haven’t we heard of this prior to now? Well, according to our sources, literal fear over the potential backlash on social media channels is expected to be so great in the “Live Free or Die” state that it could start an uprising. Limited access to the mountains will mean limited access to the money flowing in from Massachusetts and other New England states to the south, so resistance is understandable. “Without the hikers and skiers, we die,” one local was overheard saying. Further resistance is expected from other organizations dependent upon outdoor enthusiasts’ dollars. Namely the Appalachian Mountain Club, AMC, who has already filed suit against the USFS over this proposal. Not only does the AMC not want to limit the influx of visitors, they are hoping to increase traffic on their hiking trails. Public hostility discouraged the AMC from building more “huts” but it’s clear that they intend to expand anyway having recently submitted an “Add A Floor” proposal of their own hoping to add a second story to all of their huts. As the AMC spokesman stated, “If we can’t spread out, we must build up.” One source suspects they were inspired by the Cog Railroad‘s recent proposal to build a hotel on the side on Mt Washington. 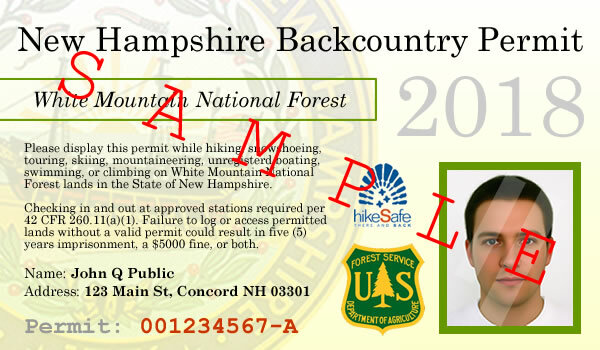 The cost of the permit, if approved, is reported to be $105 per individual and will include protections offered by the current “Hike Safe” card, which is expected to be discontinued. HikeSafe will implement the new program. Access levels, initially, are thought to be a mere 250,000 hiker-days with individual limits expected to be set to eighteen days per calendar year, monitored at “approved stations” throughout the state where hikers, skiers, and other users will be required to check in and check out before and after their activities. To have your say, to fight this proposal, please share this and sign our petition.